Thanks for sharing your photo and notes Ralph! 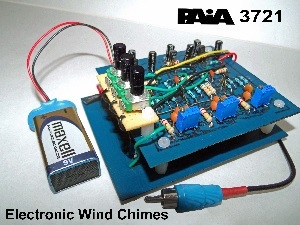 Ralph’s project notes: The Electronic Wind Chimes project appeared in the April 1973 edition of "Popular Electronics including Electronics World" and was sold by PAIA as a kit. The device in the photograph is not built from a kit but from homemade PCBs etched from the patterns in John Simonton's magazine article. While the chimes can be used as an audio source for further processing, this was mostly a nostalgia project from the days when PAIA projects would appear with some regularity in consumer electronics magazines. Multi-turn pots substitute for the original trimmers for chime sustain adjustment, and 2N3904 transistors work just fine to replace the original 2N5129s. In the magazine article (but not included in the manual) are two optional modifications. The first mod alters the timing of the chimes by changing some resistor values. I mounted three pots on a piece of perfboard and attached the trio to the top PCB. This works well; I find the chimes are most relaxing with the longest delay setting between strikes. The second mod alters the pitch of the chimes. Unfortunately altering the pitch by substituting a pot for a resistor makes the chimes sustain go out of whack and requires adjustment of the sustain trimmers. The sustain trimmers are pretty touchy and even with multi-turn trimmers it only takes a partial turn to go from chimes to sustained oscillation. This precludes using this project as a variable pitch chime synth module, so it will remain a stand alone device. Too bad some of these older projects couldn't reconfigured with voltage control and turned into FRAC modules.